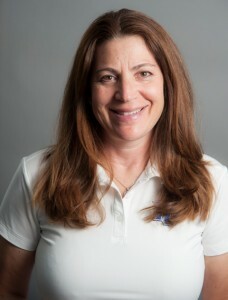 She has served as head coach of the Yeshiva University women’s tennis team since 2009 and was recently named the women’s tennis Skyline Conference Coach of the Year for the 2014 season, but Naomi Kaszovitz ’87S was already playing sports at YU—as a student athlete. A native of Oceanside, N.Y. (Kaszovitz grew up a good friend of President Richard M. Joel, also from Oceanside), and a graduate of HALB and HAFTR, Kaszovitz attended Stern because it was “the natural next step” for her and indeed proved to be a perfect fit. But while she excelled in the classroom, Kaszovitz also excelled on the court. She played on Stern’s basketball team—where she was honored as MVP in 1986—for three years and on the tennis team for two years. “Bonding with fellow teammates was fun, and playing teams that outsized us was challenging but great experience,” she recalled. Kaszovitz also worked part time for YU’s Office of Admissions, where she represented Stern College at various high schools in the tri-state area, and served as corresponding secretary of Student Council, where she helped organize student events. Nearing graduation, Kaszovitz felt a growing uncertainty about the advertising and marketing world and decided to attend law school. “Like many applying to graduate programs, I wasn’t ready to go into the real world yet,” she explained. Despite little time to prepare, Kaszovitz aced her LSATs and enrolled in YU’s Benjamin N. Cardozo School of Law, proving she could shine in any number of court systems. “I did that for five years and then, after the birth of my third child in 1995, decided to transition into the family business, with my father and brother, which was insurance,” she said. She still works at The Rampart Group today, located in Lake Success, NY. During this time, Kaszovitz remained an active tennis player—she’s a member of the United States Tennis Association (USTA)—and participated in competitive leagues around the tri-state area, which has included first-place finishes in several tournaments. In 2009, Kaszovitz’s friend and former Stern roommate, Felicia Feder Bernstein ’87S, saw a posting for a tennis coach at Stern. She immediately sent it Kaszovitz’s way. Kaszovitz met with Joe Bednarsh, YU’s Director of Athletics, Physical Education, and Recreation, and the rest is history. The traditional tennis season lasts about 6-8 weeks in the months of September and October, and usually comes to a close just as midterms begin. Sometimes, though, there’s an overlap, which means students are frantically studying their notes on the sidelines of the tennis courts between matches. This past year—her fifth as the tennis coach—Kaszovitz has enjoyed being at the helm of a more seasoned team of veteran players, who, with the addition of several strong tennis players and a student from Israel, took the team to the playoffs last season. Under Kaszovitz, the team finished 7-4 overall and 4-2 in Skyline Conference regular season play. The Maccabees finished third place in regular season to qualify for the Skyline Conference playoffs for the first time in over a decade. This year is also the first one Kaszovitz doesn’t have any assistant coaches, which really makes her recent honor as the women’s tennis Skyline Conference Coach of the Year for the 2014 season that much more impressive. “The honor was very gratifying, if unexpected, and I was humbled to receive it from my fellow coaches,” she said. For Kaszovitz, the opportunity to coach the Stern College tennis team is a perfect way to meld two of her great passions in life: athletics and Yeshiva University. “I’m proud to convey the message of Torah Umadda to today’s students. I emphasize that we are role models on and off the court and must behave with respect in sports and in everything else, and to always be a Kiddush Hashem,” she said proudly. Kaszovitz is also grateful for the opportunity to give back to her alma mater in this way. “YU continues to provide so much to me, my family and the Jewish community at large with its extensive programming and outreach,” she said. Kaszovitz’s children, Alex and Sarah, graduated Yeshiva University in 2014. Alex is starting work at an accounting firm while studying in YU’s Master’s of Accounting program and studying for his CPA exam. Sarah and her husband Netanel Goldstein ’13 YC are both at Hunter College studying for their Master’s in Special Education. Sarah teaches at Yeshiva Har Torah, while Netanel is also studying towards semicha at RIETS and teaches at TABC High School’s Sinai program (their one-month old son, Avi, is Kaszovitz’s team’s newest mascot). Kaszovitz also has sons Joshua and Eitan: Joshua is attending Yeshivat HaKotel in Israel this year, and Eitan is a junior at the David Renov Stahler High School (DRS) in the Five Towns. Kaszovitz credits her family and her husband, David, for his support in all that she does, including the many evenings of missed dinners due to coaching each night during the tennis season. She admits she couldn’t do it without the help (and dinners) of her mother, Beverly Skolnick, who encourages her love of sports and is her tennis partner and biggest fan. In addition to coaching tennis at Yeshiva, Kaszovitz was a children’s tennis coach at Camp Lavi from 2002-2013. She ran a comprehensive tennis program, which included individual and group practice drills, games and tournaments. Last summer, she ran the tennis program at Camp Kaylie for Girls, a camp that integrates children of all abilities. Kaszovitz is also actively involved in many communal organizations such as Young Israel of Lawrence- Cedarhurst, i-Shine of Chai Lifeline, Bikur Cholim, and the UJA Federation. Kaszovitz lives in Cedarhurst with her family, most of whom know better than to challenge her to a game of tennis—that is, challenge her and expect to win.